Upon request we can organize walking tours through the scenic hilly Valpolicella wine district or the spectacular Lake Garda area with its surrounding mountains. Wine-tasting combined with local dishes and appetizers will be the main ingredients for these tours. You do not need to be a trained marathon runner to do these walking tours: we will organize a walk based on your personal skills and fitness level and specific interests. Walking is the best way to really experience the countryside, witness the harvest or cultivation of the lands/vineyards and smell the local flowers or cherry trees (in blossom in April). 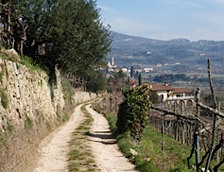 I personally go walking nearly every week with my friends in the Marano Valley of the Valpolicella area which I really enjoy. Walking tracks that go over the top of the rolling hills give you a 360� view of the wine-growing region with the Alps rising up on the horizon. Time to rest will be included in these tours to allow visits to a small local church, a view point or small vineyards that offer special local dishes with their own wines. we can organize walking tours of two, three or four hours during the day with various stops along the way at different wineries where you can taste the local wines paired with local food. A light lunch can be organized at a local Osteria or at a winery. You will see the nicest valleys in the Valpolicella district with its picturesque old villages, renaissance Villas and old churches. 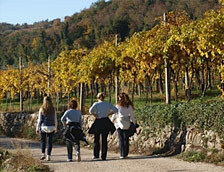 Walking tours can also be organized at Lake Garda and in Verona. In Verona, I would particularly recommend the Tour of the Osteria, which are centuries old local inns/pubs where the local Veronese come and drink a good glass of local wine and have some of the famous Italian aperitives with it: a real meeting place between 4 and 9 pm. For these tours we can organize a pick up by car or minivan from your accommodation and then drive out into the Valpolicella countryside.